‘…sharing this record with a friend is an easy way to share the gospel. These songs are anthems for reigniting your faith in Jesus by equipping you with His Word. We pray that it moves you to walk with Him in a new way. This record sounds best when you sing along loudly!…’ Comprising of brothers Ben and Josh Calhoun and good friend David Blascoe; Citizen Way, a trio from Elgin, Illinois is everything that a pop/CCM enthusiast can hope for in a band. Formed in 2004 and signed to Fair Trade Services in 2012, it was the success of singles “How Sweet the Sound”, “Should’ve Been Me” and “Evidence” from their debut album Love is the Evidence that they released in 2013, that placed them on the map of new CCM bands of that particular year to be on the lookout for. Now fastforward 2 years, and the sound is much more mature, and much more refined. An infusion of musical sounds similar to that of Josh Wilson, Aaron Shust, Sidewalk Prophets and We are Leo; this infusion of pop/rock, with a few underlings of electronic goodness and an overarching atmosphere of worship is what makes 2.0 one of the standouts of March 2016. It is a great follow-up album to one of the most successful label debut albums within the realm of CCM in 2013, and quite possibly this half of the 2010s. With less lyrical simplicity that seemed to be at the forefront on Love is the Evidence; the band bring to us clever lyricism and a heart full of encouragement as the album as a whole acts as a vessel of hope to those who need it, in a non-intrusive fun-filled way. From current radio single “When I’m With You” to the promotional “Rivals” and the dance inspired “Bulletproof”, this is an album you don’t want to miss if you long to listen to an album that has the very best of what CCM has to offer! Starting out the album with the powerful rock-n-roll hard-hitting “Elevated”, lead singer Ben Calhoun delivers his best ‘Rhett Walker meets Mac Powell’ voice as this high energy 3:09 track brings to us a theme of us believing that situations are overcome not by our own strength but by Christ Jesus alone. Being elevated is being lifted up, above our circumstances and viewing the whole situation from a point of view that is different from ours. As we focus on our trials and situations with the outlook that Christ also has, we can feel more in control of the situations we do face, knowing full well that ‘…there’s not a weapon formed against me, Lord, that You can’t conquer…I wanna live, I wanna love, I wanna go where You lead me…’ Enthusiastic and passionate, emotive and heartfelt, “Elevated” is a great first track for an album full of genres and a much more mature band, quite possibly the band to improve stylistically and lyrically out of all the new bands that released debut material in 2013! “Rivals” follows, and will probably be my pick of being a future radio single, maybe #2 or #3. A pure pop melody if ever you heard one, it is the second verse that really hits the nail on the head about the message “Rivals” paints- “…greater is He that is in you, than any power in this world, that’s a promise money just can’t buy, there’s gonna be pain, oh, there’s gonna be trials, but lift your eyes up, lift up your eyes…” Knowing that the same power in Christ is available to us in the form of the Holy Spirit as we delve through life in all its facets is a great promise to hold onto, and “Rivals” is a testament to this fact- that because Christ has no rivals, we ought not to have any. Our battles aren’t need to be fussed over, because of this life-changing truth- that we’ve already won. Whatever we’re facing- Christ has overcome that. Kudos to the band for such a fresh and invigorating song, and one that should be the song to listen to if you only listen to one from 2.0. At only 3:00, “All My Cares” is a heavy piano and electronic track where Ben invites us all to cast our cares upon a God who welcomes us all to bring all our troubles to Him in the first place. While a little repetitious in the chorus, the heart of the melody is still there, with the band nevertheless providing us with, at least, a song that stands firmly on the truth that all we need to do is give our worries to the Lord, regardless of our circumstances. Citizen Way also give us themes of us holding onto Christ when there’s nothing left for us to do except exercise the faith we’ve known to be true all the years (“Just Hold On” as CCM-esque as can be, and quite possibly a radio single at some point), as well as asserting and believing that we are indeed bulletproof from all the thing thrown our way, because of the armour of God we’ve been given through Christ Jesus our Lord and the Word of God (“Bulletproof”, in 70s dance music fashion); yet it is “Set it on Fire” that is very much a standout on the album (alongside “Rivals” and “Bulletproof” for me), as the band deliver some hard-hitting and confronting lyrics that have made myself think over the last few days. With a rocking electric guitar introduction, Ben leaps into the first verse, where he delivers the truth…or so we think it is. Every moment in our lives, we have been told to have a plan B, or C, or even D, because frankly, when has plan A ever worked 100% of the time? The song is about having just a plan A- following Christ, in whatever He has called us to do. To live according to what He longs for us to do and accomplish is a freeing moment of realisation and clarity, and as “Set it On Fire” suggests, we have to burn away all of our plans if it means for us to become distant from God and to try and accomplish our tasks based on human strength. This is where the album title comes into play- 2.0 means a reset, a 180 degree change, a turn around that may be unprecedented, but necessary. Once we realise that having plan B, C and D may involuntarily mean we don’t trust God with plan A, we can make some decisions and figure out if we truly trust Him 100% or not. Challenging and confronting, “Set it On Fire” is a call for us to have a redo if we need to, to trust God fully and rely only on Him when circumstances call of us to tackle it all alone. 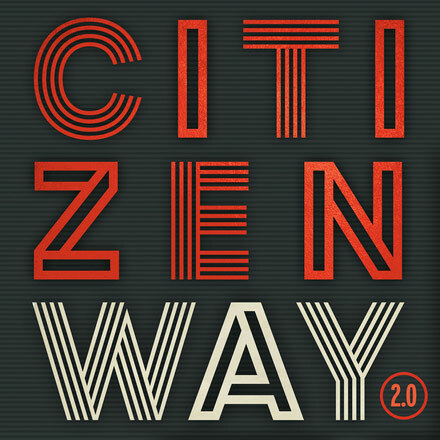 Well done Citizen Way for such a heartfelt track, and one of my favourites on 2.0! Citizen Way have shown us what a few years can make on the band’s sound, as they have quickly become the band to mature the most between first album and second in recent CCM history (the last one I can think of is being Josh Wilson, from Trying to Fit an Ocean in a Cup to Life is Not a Snapshot). As the band deliver to us a myriad of genres, from dance and pop to praise, worship, contemporary and acoustic, this is an album worthy of being one of my favourites in 2016 thus far (alongside albums from Steven Curtis Chapman, Joy Enriquez, Newsboys, Meredith Andrews and Rachel Platten). 2.0 is indeed a stylistic change for the band, from Adult Contemporary to more of a pop/rock sound, and is a welcomed one by me. An album certain to be played on repeat on my iTunes playlist for months to come, kudos to Ben and the rest of the band for creating 11 moments of inspiration, encouragement and heartfelt moments of poignancy!